LymeFiber has contracted with ValleyNet to install and operate a fiber-optic network in Lyme. We have been working with Carole Monroe, their CEO, since the start of the project. Carole has decided to retire in early 2019. ValleyNet has appointed David Rottmayer to be Carole’s successor. Carole will stay on in a consulting role. LymeFiber looks forward to working with both Carole and David. For more details, see the ValleyNet Press Release. 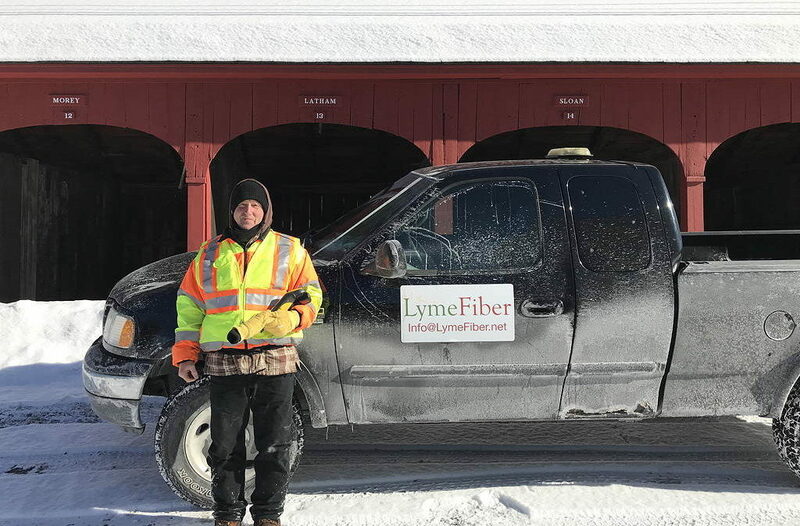 In January, people started to see LymeFiber trucks working in Lyme. This photo shows Klee Smith, a contractor for ValleyNet in front of Lyme’s horse sheds. Klee is conducting a pole survey to create an inventory of all the poles along with their geographic coordinates. As of January 2019, the number of signups crossed 200! We’re expecting that between 300 and 400 people will ultimately sign up by the time we begin to provide service in Spring 2020. There’s no obligation, but if you would like to indicate your interest in a high-speed fiber connection, please fill out the form at the Sign Up Now page. We opened the signup process for LymeFiber in mid-December 2018 to allow Lyme residents to express an interest in becoming a customer of our universal high-speed internet service. After just two weeks, right before Christmas, over 160 people had already signed up. There is no obligation – we will get back to you to confirm you want to subscribe as we get closer to rolling out service to the town in Spring 2020. You can get more details on our Frequently Asked Questions page. If you want to sign up, fill in the LymeFiber Signup form at https://www.lymefiber.net/sign-up-for-lymefiber/ Thanks, Lyme!